Tummy Time Prop & Play is rated 4.5 out of 5 by 32. Every baby needs a place to play. With the Bright Starts Tummy Time Prop & Play mat, your little cub will have the coziest space to do just that! Plush and padded, this grizzly bear mat offers support for all your baby’s wiggles and kicks. The sweet matching prop pillow gives baby a lift as she learns to push up during those first few months. Little loops of satin Taggies surrounding the play mat will give your baby extra entertainment and comfort. Baby can also explore crinkle sounds, rattles and other toy attachments. 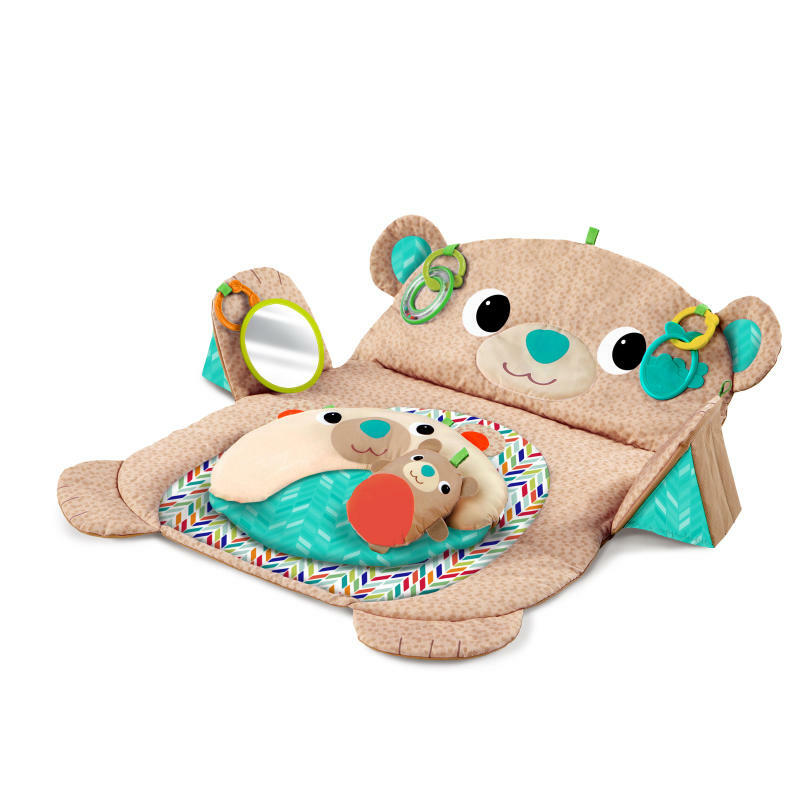 Make tummy time even easier by propping up the grizzly bear’s head to bring the toys within reach. The propped up paws features a baby-safe mirror to engage baby and encourage head movements from left to right. Made to fit well in small spaces, you can bring this mat along when traveling for creature comforts wherever you are! Rated 3 out of 5 by Brobinson from My son never liked tummy time and this toy didn’t do much to help that. He enjoyed the mirror sometimes but for the most part was just so miserable on his tummy that he didn’t notice the mat. I had trouble at times keeping the head and arms propped up. This did fold up small and store nicely under the crib. A an older baby or one who is better at tummy time may enjoy this toy but we didn’t get much benefit from it. Rated 3 out of 5 by Brobinson from My son never liked tummy My son never liked tummy time and this toy didn't do much to help that. He enjoyed the mirror sometimes but for the most part was just so miserable on his tummy that he didn't notice the mat. I had trouble at times keeping the head and arms propped up. This did fold up small and store nicely under the crib. A an older baby or one who is better at tummy time may enjoy this toy but we didn't get much benefit from it. Rated 4 out of 5 by Jackie22 from Very fun I really enjoyed this product. It was a fun way to prop my baby up and she LOVES mirrors. She calls the little bear a potato, that could look more like a bear. It was short lives just because babies don't stay in one stage for long. Rated 5 out of 5 by Mellie2015 from Perfect for Tummy Time This is a mother's dream. It has multiple features which is a plus. Rated 5 out of 5 by msamps from Adorable design. Love the mirror for baby to look at himself. Rated 5 out of 5 by msamps from Adorable design. Love th Adorable design. Love the mirror for baby to look at himself. Rated 4 out of 5 by Megan2724 from Very cool design that allows my nephew to enjoy tummy time much more than he did without it! Rated 4 out of 5 by Megan2724 from Very cool design that all Very cool design that allows my nephew to enjoy tummy time much more than he did without it!